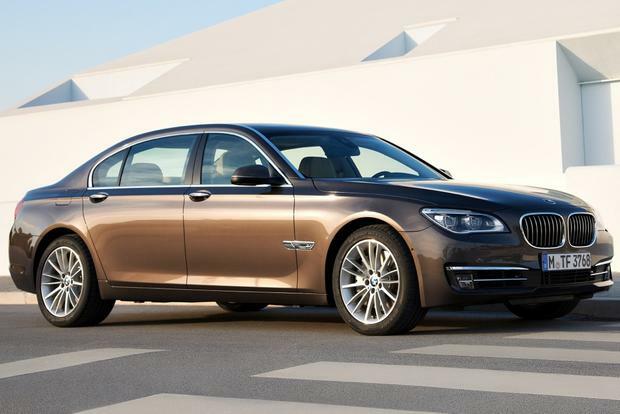 The 2015 BMW 7 Series isn't the newest executive-class sedan, but BMW has kept it fresh with many updates, including a diesel motor. 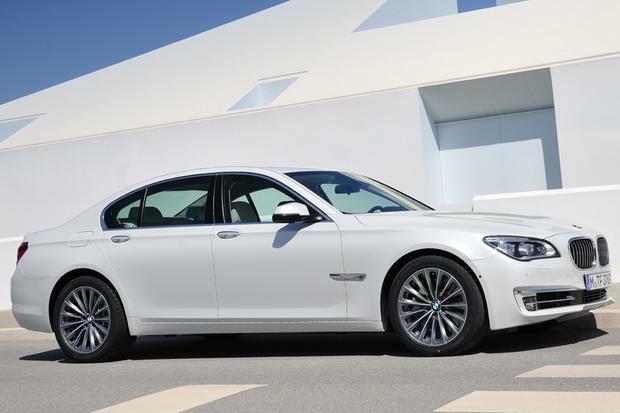 The 2013 BMW 7 Series gets a bunch of updates, and it was already great. Is this the best luxury sedan ever? Find out in our review. 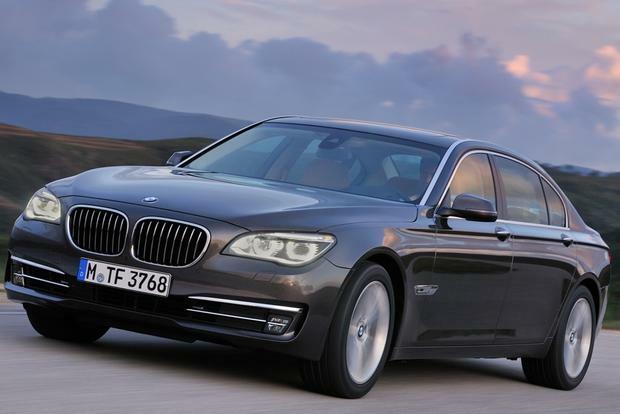 Is the 2012 BMW 7 Series still the driver's choice among executive sedans, or has BMW changed its philosophy? When the 2014 BMW 7 Series was brand-new back in '09, it was hard to imagine that this majestic sedan would ever need improvement. But time waits for no car, so BMW called in a preemptive strike last year. The old 6-speed automatic was ditched, replaced across the lineup by a superior 8-speed, and the 750i's sublime twin-turbo V8 received a major steroid injection, adding 45 horsepower for a dizzying total of 445 hp. This year, the enhancements continue with a new dynamic instrument cluster and an updated iDrive system that includes a touchpad with fingertip-scribble recognition. This is the part where we're supposed to mention our criticisms, but the 7 Series makes that task exceedingly difficult -- especially with all the recent changes. Our only real complaint is completely subjective: If you ask us, BMW's big cruiser hasn't looked quite right since the E38 generation from a decade ago. Otherwise, pretty much everything about this car is first-rate. Sure, we'd like to see more than 30 miles per gallon from the ActiveHybrid, but the rival LS 600h from Lexus is considerably thirstier. Even there the BMW still manages to secure some bragging rights. Overall, the 2014 7 Series is the best-yet version of what was already a nearly faultless car. BMW easily could have stood pat over the past couple of years, but instead it has put the 7 Series right back in the conversation about the best sedan in the world. 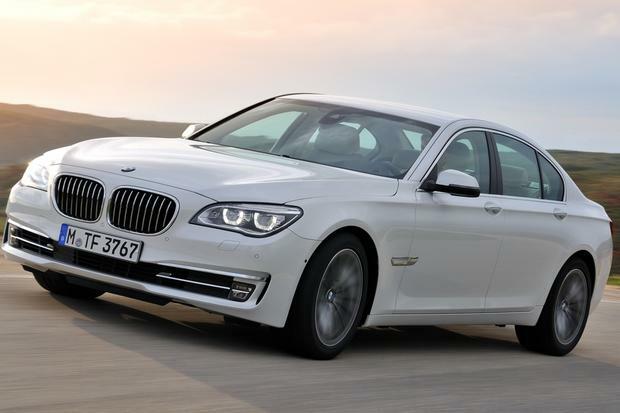 The 7 Series gets new standard features such as Bluetooth streaming audio, BMW Apps and BMW Online services. There's also an updated iDrive controller with a fingertip touchpad, and the optional power trunk boasts a hands-free foot sensor. Finally, a new instrument cluster provides a customized display based on driving mode. The entry-level 740i is powered by the turbocharged N55 inline 6-cylinder, rated at 315 hp and 330 lb-ft of torque in this application. Fuel economy is 19 mpg city/29 mpg hwy with rear-wheel drive (both regular- and long-wheelbase versions) and 19 mpg city/28 mpg hwy in the all-wheel-drive, long-wheelbase 740Li xDrive. The ActiveHybrid 7 combines a turbo 6-cylinder with an AC electric motor for a total of 349 hp. Fuel economy is 22 mpg city/30 mpg hwy. 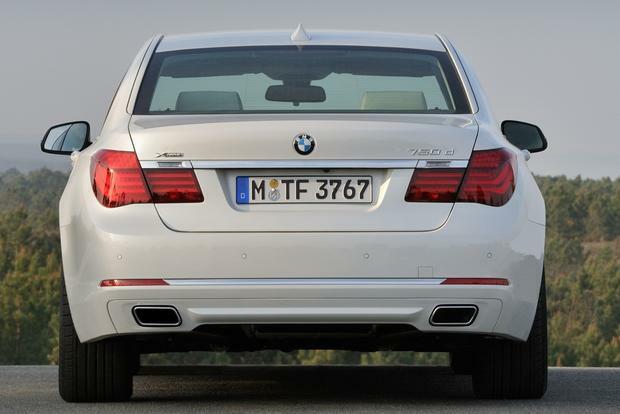 The 750i's twin-turbocharged 4.4-liter V8 pumps out 445 hp and 480 lb-ft. Fuel economy is 17 mpg city/25 mpg hwy for the 750i, 16 mpg city/25 mpg hwy for the 750Li and 16 mpg city/24 mpg hwy for both the 750i xDrive and 750Li xDrive. 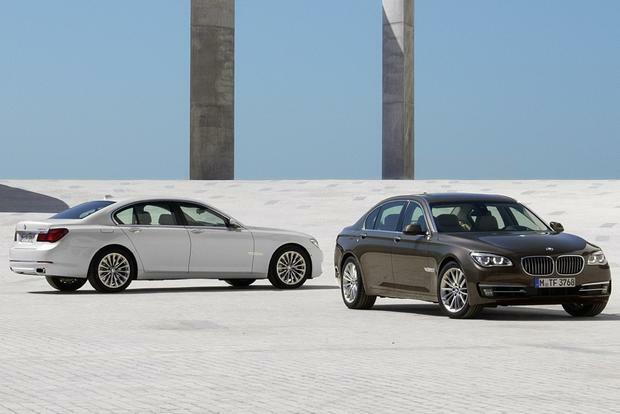 Should you require even more speed, all the 750i models are also offered in juiced-up Alpina B7 form (540 hp, 538 lb-ft). Environmental Protection Agency fuel economy estimates are unchanged from the regular 750i equivalents, except for the short-wheelbase, rear-wheel-drive B7, which is rated at 16 mpg city/25 mpg hwy. The range-topping 760Li's twin-turbocharged 6.0-liter V12 cranks out a monumental 535 hp and 550 lb-ft. Fuel economy is 13 mpg city/20 mpg hwy. 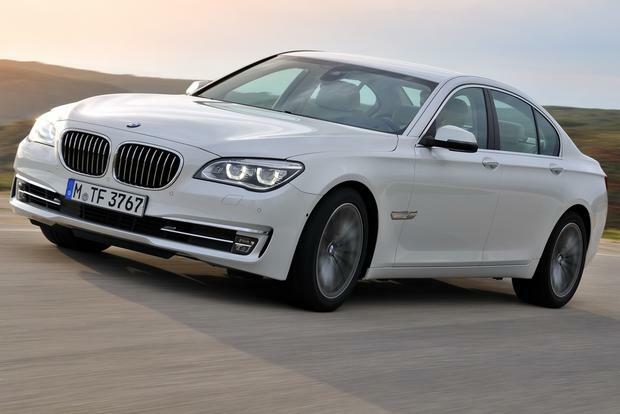 The 2014 BMW 7 Series sedan is offered in four basic trim levels distinguished mainly by engine type: 6-cylinder 740i, 6-cylinder ActiveHybrid 7, 8-cylinder 750i and 12-cylinder 760Li. The 740i and 750i are short-wheelbase by default but offer an optional long wheelbase (740Li and 750Li) that adds a few grand to the bottom line; the 760Li and the ActiveHybrid 7 are long-wheelbase-only. Note that the long-wheelbase models ride on a self-leveling air suspension. The 740i ($74,925) comes standard with 18-inch alloy wheels, adaptive xenon headlamps, fog lights, electronically adjustable suspension and performance settings, front and rear parking sensors, a sunroof, leather upholstery, power front seats with lumbar support and memory functions, a power tilt/telescopic steering wheel, quadruple-zone automatic climate control, iPod/USB and Bluetooth connectivity, a 10-speaker audio system with dual subwoofers, and the hard-drive-based iDrive infotainment system with navigation, digital music storage and a 10.2-in wide-screen display with a rearview camera. The ActiveHybrid 7 ($85,225) tacks an electric propulsion system onto the 740i's inline 6-cylinder and includes hybrid-specific information displays, among other eco-themed tweaks. The 750i ($88,225) adds a twin-turbocharged V8, 19-in wheels and niceties such as power automatic soft-closing doors, a power trunk lid with a foot sensor, 20-way Multi-contour heated front seats and Nappa leather upholstery. The 760Li ($142,125) goes to town with a twin-turbo V12, rear bucket seats with power adjustments, a leather-trimmed instrument panel, a head-up display and side- and top-view cameras. Many of the higher trims' standard features are available as options on lesser models. Among the choice extras are an M Sport appearance package, a Bang & Olufsen audio system and a radar-based self-parking system. The Rear Entertainment package boasts twin 9.2-in screens that "appear to be 'floating' on" the front headrests, according to BMW. The very rare, high-performance Alpina B7 model ($129,225) boasts a stronger version of the 750i's twin-turbo V8, 21-in wheels, a sport-tuned suspension and various Alpina-specific styling cues. 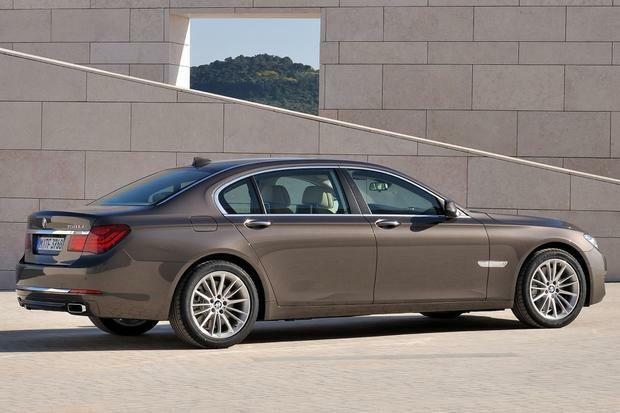 The 7 Series comes with 4-wheel anti-lock disc brakes, active head restraints and eight airbags (front, front-knee, front-side and full-length side curtain). A standout among the numerous standard and optional safety technologies is Attention Assistant, a Mercedes-inspired program that monitors your driving habits and notifies you with a cup-of-coffee icon when your attention wanders. 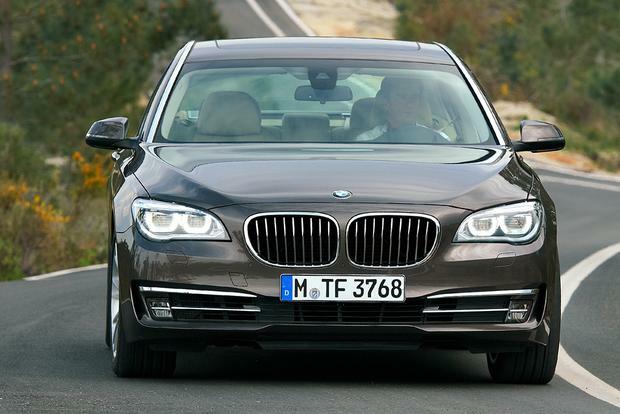 Neither the government nor the independent Insurance Institute for Highway Safety has crash-tested the 7 Series. In our interior evaluation, we noted that even the bone-stock 740i has a mind-blowing roster of luxuries. You could drive one for the rest of your life and never want for more. Well, we take that back. You'll absolutely want the sublimely supportive multi-contour front seats, which are a bargain at whatever BMW's charging (and come standard on 750i and above). The gauges use BMW's classic white-on-black theme, changing to orange-on-black at night, but they're complemented by an electronic display that seamlessly integrates with the bottom of the gauges when the car's on -- and adopts a unique aesthetic theme to complement the selected driving mode. The quality of the interior materials is outstanding, and the tastefully understated dashboard design incorporates a subtly driverward-canted center stack in a nod to BMW tradition. The iDrive system includes a beautiful 10.2-in wide-screen display and incredible feature depth. 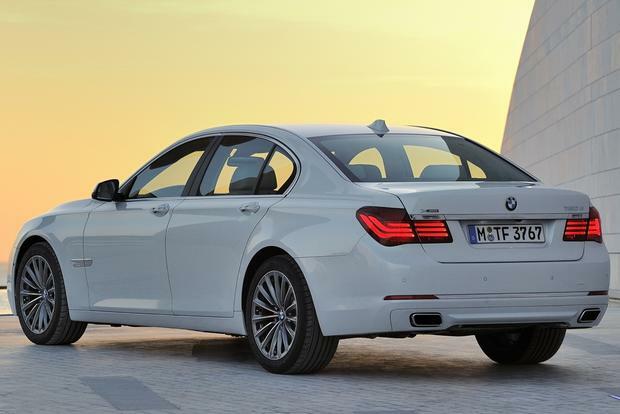 The standard 7 Series back seat is roomy enough for all but chauffeur-driven shoppers, who might plausibly want more legroom while they're kicking back with their iPads -- and the extended-wheelbase Li models certainly satisfy that desire. The regular 7 Series' trunk officially measures a modest 14 cu ft, but the Germans clearly have a funny way of translating their trunk sizes to our measurements, because this trunk is huge. The ActiveHybrid 7's trunk only loses about 1 cu ft of space to the hybrid hardware, checking in at just under 13 cu ft. Under the hood, the 740i's acceleration is swift and seamless enough to satisfy most tastes. Still, we wouldn't be able to resist the siren call of the 750i's twin-turbocharged 4.4-liter V8. This is one of our favorite engines, doling out force and refinement in equally awesome doses. It's a wickedly fast yet refined sedan. The Alpina B7 offers even more power, of course, but we can't imagine feeling dissatisfied with the 750i's output. As for the 760Li's twin-turbocharged 6.0-liter V12, it crushes most comers with its 535-hp punch, but it's only offered in long-wheelbase form, which is a bummer. The only real disappointment, though, is the ActiveHybrid 7, which delivers about the same acceleration as the 740i and doesn't impress on the fuel economy front, either. On the road, you'll be getting one of the world's supreme fast-lane cruisers in the 2014 7 Series. BMW basically engineers this car to do 155 miles per hour on the German Autobahn with maximum composure. We can't go that fast in this country, of course, but suffice it to say that the 7 Series has few peers at high speed. We do prefer the invincible Mercedes-Benz S-Class on rough roads, but the BMW's underpinnings are nonetheless highly skilled at soaking up bumps. On winding pavement, the 7 Series' BMW DNA remains detectable. Turn-in is crisp and body roll well-disciplined through corners; however, the Audi A8, Jaguar XJ and Porsche Panamera will give the 7 Series a run for its money. Audi A8/S8 -- The executive-class Audi may have cookie-cutter styling, but try the twin-turbocharged S8 for acceleration that rivals the best from BMW. Mercedes-Benz S-Class -- The new S-Class is once again the car to beat in this class. It's not as involving to drive as the 7, however. Jaguar XJ -- The XJ doesn't have the consistent excellence of the German models across the board, but it compensates with loads of British driving character and easily the most expressive styling of the lot. The 750i is an immensely satisfying car at a price that's pretty reasonable for this segment.